Cadence was looking for a more cost-effective way to augment the compute needs of their software developers, and provide greater agility and consistency with DevOps principles. With everyone working out of a single environment, a common server farm with thousands of machines, different workload types and users competed with each other for resources. One forward thinking individual on the Cadence development team saw the potential in Amazon Web Services (AWS) to cut costs and improve efficiency, leading the company to explore moving some of their workloads to the public cloud. “We didn’t have anyone on staff with direct experience working in the cloud and wanted to ensure we started on the right foot and overcome any potential skepticism,” said Stanton. By way of recommendation, Cadence turned to Six Nines IT, a premier Information Technology consulting company specializing in helping businesses move to Amazon Web Services (AWS), Azure, and Google Cloud Platform. As their cloud architect, Six Nines provided resources who helped Cadence understand how AWS operates, how to best utilize the resources offered by AWS, and ensure that those resources could support the needs of their developers. 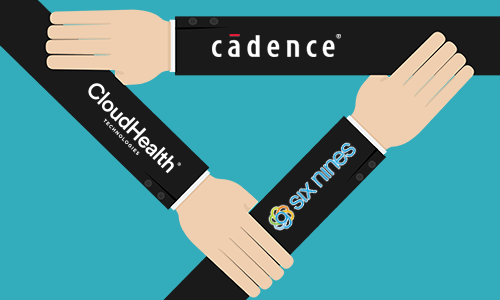 As a partner of CloudHealth Technologies, Six Nines leveraged the power of the industry leading Cloud Service Management platform, CloudHealth, enabling them to continuously optimize and proactively monitor Cadence’s environment. “Our mission is to help our customers adopt and support the cloud responsibly, and ensure it’s an effective business driver,” said Jason Cutrer, Founder and President, Six Nines. Cadence started their cloud journey by focusing on the different use cases their research and development groups had. One that stood out was moving their internal software development process to the cloud, primarily focusing on software regression testing. AWS allowed Cadence to isolate workloads from one another and ensure users and applications didn’t compete for resources. The company was able to run faster and significantly reduced job times. Furthermore, when workloads don’t perform as expected, Cadence has CloudHealth’s performance metrics to analyze and troubleshoot the problem. In an effort to continuously optimize and cut costs, Cadence leverages reserved instances for many servers that run 24/7. With multiple development teams spread across four business units and the product teams developing hundreds of products, Cadence and Six Nines are continuously identifying where it makes sense to transition environments to the cloud. They’ve built on early success transitioning workloads to the cloud and keep the momentum rolling with increasing interest from additional groups within the organization. In order to automate and dynamically deploy and scale their workloads, Six Nines utilized several native AWS tools as well as various industry best practice DevOps tools. In order to simplify their resource deployment and remove the risk of human error, Six Nines utilized AWS CloudFormations and Ansible. Once deployed, Cadence can leverage some custom scaling scripts along with Auto Scaling, Elastic Load Balancing and Amazon EC2 Spot Instances to expand and contract resources as well as optimize their spend while at increased capacity. Contact Six Nines IT for a free consultation and your own cloud transformation.